Whether you're looking for a new and elegant contemporary home or a historic farmhouse for sale, you just may find it in the waterfront community of Lofall. 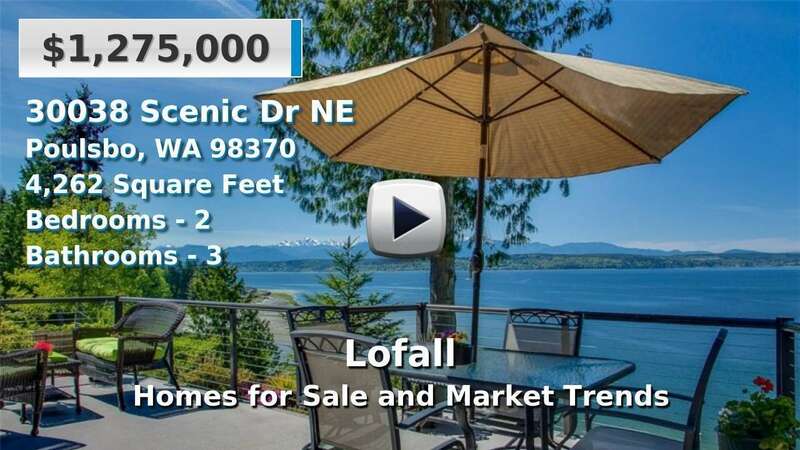 Located just 6 miles north of Poulsbo, one of the peninsula's largest cities, Lofall has the peace and quiet of a small town but the easy access to city amenities that strikes a perfect balance. Not to mention, Lofall is on the shores of Hood Canal, a waterway well known for its family-friendly recreation, and is just a few miles south of the bridge to Port Ludlow and the Olympic Peninsula. 2 Beds | 3 Baths | 2340 sq. Ft.
3 Beds | 2.5 Baths | 3888 sq. Ft.
Blue Summit Realty has the most accurate and up to date Lofall real estate listings on the web. Currently there are 2 homes for sale, and 11 vacant land properties in Lofall. Of the 13 total Lofall residential listings for sale 0 are bank owned, 0 are short sales, 0 are new construction, and 0 are townhomes. The price ranges from $1,045,000 to $0 with a median list price of $1,309,000 and median sold price of $367,500. Make sure to refine your Lofall real estate search by property type, price, square footage, bedrooms, bathrooms and more with the search tool above or view the Lofall listings on our interactive map. Our Lofall real estate listings were updated 25 minutes ago.